I’ve been thinking a lot today about the end of this decade (the literary pundits are agonizing over what to call it – the “aughts”?). Ten years ago I lived in a family of four, had fewer grey hairs, and was a stay at home mom who had just discovered gardening and was thinking about learning to design gardens. Photography meant pulling out a compact film camera on vacations. I assumed my life track was set for good. What a difference a decade makes. Despite some blips on the radar, I have few regrets and many life changes for which to be grateful. OK, I don’t like being an empty nester. But I will always be grateful for my mid-life transformation from lawyer to landscape designer, stretching my creative side. And even more grateful and excited at the new sights that have greeted my eyes as I work as a photographer, whether in gardens or outside them (more of that to come next year). 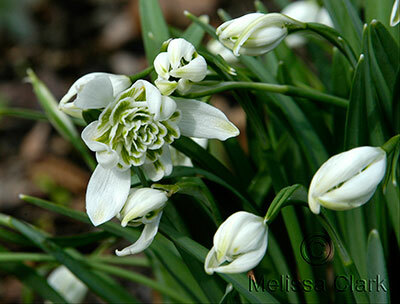 Snowdrops (Galanthus nivalis ‘Flore Pleno’, the double form shown above) have always seemed to me to be symbols of hope and rebirth. They appear before almost any other bulb in spring. So as 2009 leaves us and we look forward to the new decade – which on a global basis will hopefully be an improvement on the last ten years – I wish you the very best for a wonderful new year. Thanks for visiting, and I hope you will come back often. 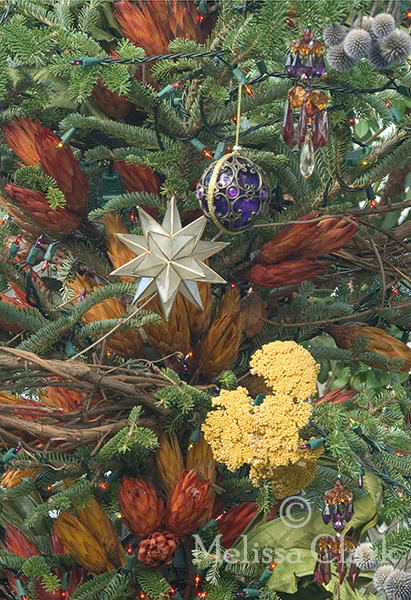 Outside of the main Conservatory halls, there were smaller vistas and views to take in and capture – like the Christmas tree ornaments above. So in the spirit of the holidays, here are some of my best images from that trip. If you haven’t been to Longwood, plan a road trip soon. By the time this beauty was in full bloom, I was dying to get out my macro lens. Photographing flowers close up is difficult outdoors, what with wind, lighting issues, and finding a specimen that hasn’t been nibbled on by various insects or damaged by some kind of leaf or petal blight. Here, however, was perfection. What I really wanted to capture was the velvety texture of the red petals, the Christmas-y juxtaposition of the green throat against the red blossoms, and the flawless line of the stamens. 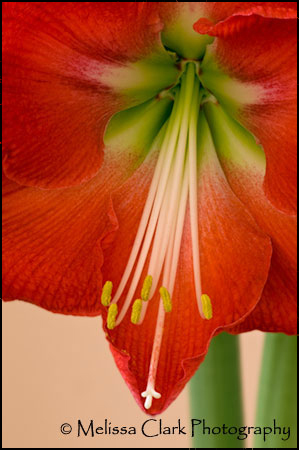 The single white stamen tip positioned just inside one of the petals was the icing on the cake. This ‘Monaco’ is royalty indeed. Hope you enjoy the view. 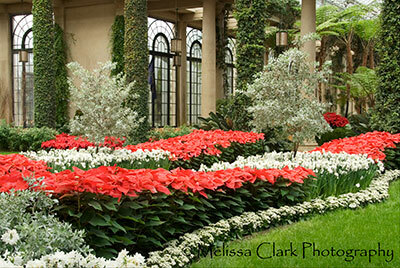 One of my favorite books is Seeing Gardens by Sam Abell, a wonderful National Geographic photographer. He has an extraordinary eye for detail. In this book, he observes that “Some of the gardens that mean the most are impromptu arrangements.” One of my favorite images in the book is a still life of pears on a windowsill, a gauzy curtain lifting in the breeze, with the Kremlin and St. Basil’s cupola visible in the background. In another, a Moscow woman’s colorful scarf of vibrant flowers illuminates her drab surroundings on a city bus, becoming the “garden” for the viewer’s eye. Abell’s genius is shared by other artists. Last April I walked the streets in Charleston’s Battery Park neighborhood as part of a photography workshop. 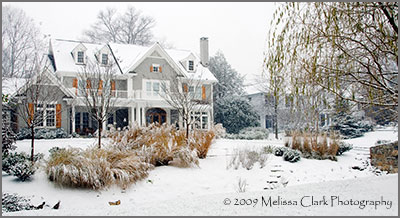 As I did, I saw more than one example of a landscape designer’s skill in creating beauty on a minimalistic scale. The gardens in this part of Charleston are tiny jewels, and I was in town on a photography workshop that had just missed the Festival of Houses and Gardens tours offered each spring. But wonderful views of the gardens’ entry “faces” were there if you looked closely. 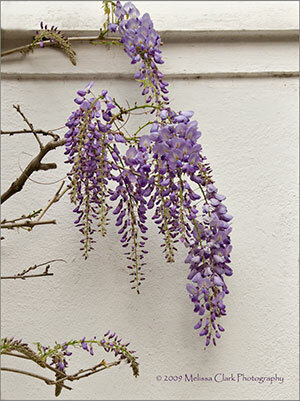 In the photo at left, early wisteria blooms spill over a whitewashed stucco wall topped with wrought iron on a garden on Meeting Street. 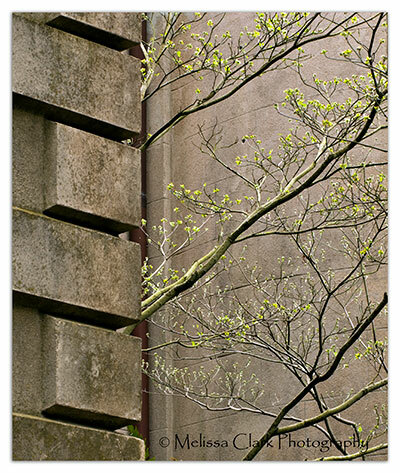 Further along the same street, I encountered a breathtaking juxtaposition of delicate flowering dogwood branches just beginning to leaf out against a background of beige stone walls. This image won raves from the instructor in a critique session the next day; but his eyes glazed over as I explained that I had been taken not only by the minimalist visual beauty of the image (thanks, Mr. Abell) but also the designer’s inspired choice of tree for the shady spot. Sometimes there are unexpected bonuses for a garden designer behind the lens. So here we are in early December, one snowfall already behind us. This creates all kinds of havoc for the landscape design firm where I work. You can’t blow frozen leaves, or easily extract them from gutters. 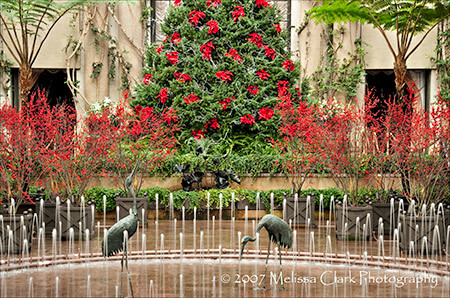 Gardens blanketed in snow, however, have their own special charm if they have been well-designed — which makes photographing them especially rewarding. The structure often comes from trees, grasses, or other plants that don’t disappear in the winter. That’s what gives the front garden shown above an arresting presence even though many perennials on the streambank have disappeared until spring. 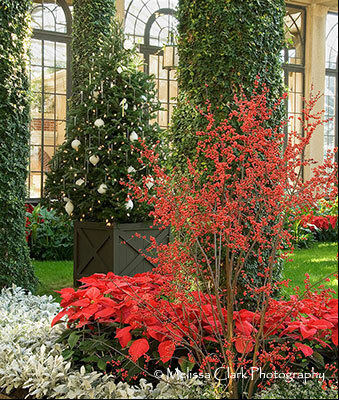 Another way to provide structure for the winter garden is to place a bit of what garden designers call “hardscape” – a built element, like a bench, obelisk or eye-catching urn – in a central place. Here, in my own front garden, I’m lucky enough to have both a great crabapple tree with architecturally arresting branches and a small teak bench underneath, on a landing area near the front steps of my house. 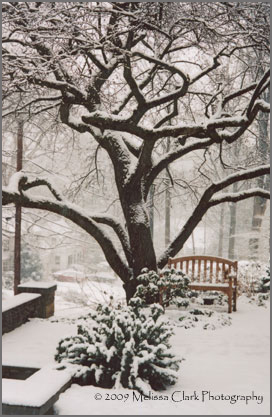 And it was this view that drew me out on a snowy day, to capture the tree, the season, and the design that pulled my eye. Hooray, I thought. It works. And it does. The weekend forecast is for more “wintry mix.” If we get snow and not ice, I may well be out, camera in hand. Gardens have their own beauty in winter, if you look hard enough. I’ve observed gardens in many ways, but two views predominate – through my camera lens, or on my knees. Close-up, or big picture. Either way I am thinking of views, looking to get it right for the viewer or the garden owner. Why “Garden Shoots”? It’s a double-duty moniker. I design gardens for a living, and I photograph them (and other subjects) for pleasure and as a freelance photographer. I’ve learned that each activity enhances the other. So I’m here to share what I’ve learned in both spheres with you, and hope you’ll enjoy what I have to offer.